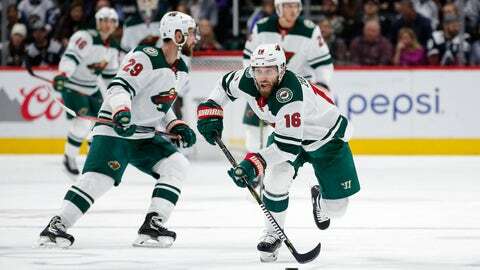 Two teams coming off disappointing opening-night losses will look to get to the .500 mark Saturday night when the Vegas Golden Knights start a five-game road trip against the Minnesota Wild. Vegas’ 5-2 loss at the hands of the Philadelphia Flyers Thursday evening was surprising for several reasons, not the least of which was that goalie Marc-Andre Fleury lasted just 30:11. That was long enough for Philadelphia to pump five goals past him on just 16 shots. After making it to the Stanley Cup Finals in its expansion season, Vegas loaded up for another run by acquiring Pacioretty from Montreal and inking Paul Stastny as a free agent in the offseason. They basically took the place of James Neal and David Perron, who are now skating in Calgary and St. Louis, respectively. There was no immediate impact by Pacioretty and Stastny in their Golden Knights debut. Neither scored a point, both were minus one and they combined for just four shots on goal. Vegas center Pierre-Edouard Bellemare referred to the loss as a slap in the face. Coach Gerard Gallant said it’s just a matter of the team getting back to work. They also didn’t go Minnesota’s way in Denver, where not even another Zach Parise opening-night marker and a terrific performance by goalie Devan Dubnyk could save the Wild from a 4-1 loss to Colorado. Parise’s tap-in marker just 6:14 into the game marked his 10th goal on opening night, second among active players. He nearly notched his 11th to snap a 1-1 tie in the second period, but his backhand bat of a rebound caromed off the right post. While Parise scored, Dubnyk mostly denied. He made 36 saves on 38 shots, keeping Minnesota in contention for two points on a night where it was outshot 40-21. Among his best saves were a glorious glove stop of Nathan MacKinnon and a sprawling pad save on a Colin Wilson attempt that seemed certain to find net. But two empty-netters in the last 1:53 tagged the Wild with a loss that it probably deserved, given the Avalanche’s nearly 2-to-1 advantage in shots on net. The good news for Minnesota is that it’s entering a home-heavy stretch of its schedule. Saturday’s game kicks off the first of two three-game homestands in the next three weeks. Of the next nine games, seven will be played at Xcel Energy Center.